A local councillor spent over 13 hours stuck in his car last night due to the wintry weather in the north of England. 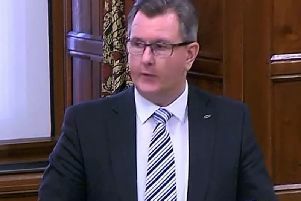 The UUP group leader on Antrim and Newtownabbey Borough Council, Ald Mark Cosgrove, had been in Bradford on business and was due to fly home from Manchester yesterday evening. Ald Cosgrove was stuck in his car for over 13 hours. Mr Cosgrove set off from Yorkshire at around 4.15pm, estimating that he would make his flight home at 6.40pm in good time. However, while he was making the 50-mile journey to the airport, the weather worsened and the authorities made the decision to close a section of the M62 motorway. Taking to Facebook in the early hours of February 2 to detail the situation, the Glengormley representative said: “If anyone’s still up! I left work at 4.15pm to travel 50 miles for a flight home at 6.40pm. “I’ve now been stuck on the M62 near Rochdale for eight hours and counting. No idea where I’m sleeping. No idea how or when I’m going to get home. Well-wishers took to social media to offer support during the incident. It is understood temperatures dropped to around minus four during the motorway closure. The emergency services helped to move traffic off the carriageway in the early hours of this morning. Confirming that he is safely off the motorway and resting, Ald Cosgrove said: “Thanks everyone. I finally moved (back the way I came) at 5.40am. This was a full 13.5 hours after I was stranded.